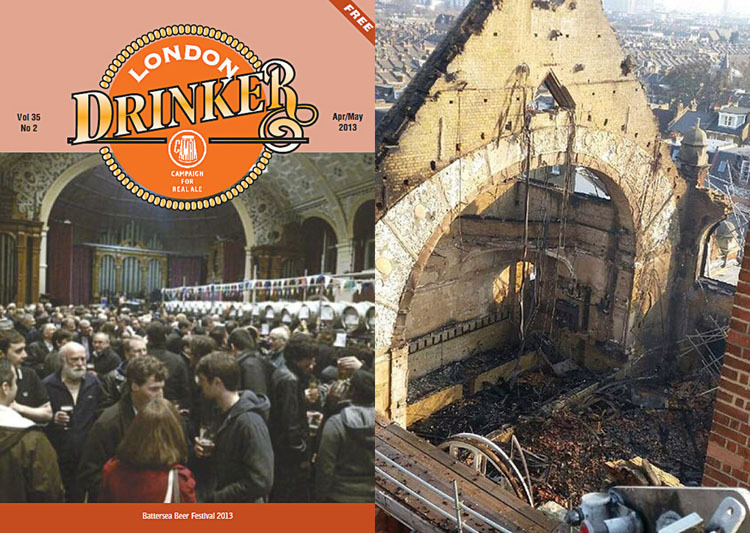 Following the major fire at the Battersea Arts Centre on Friday 13th March 2015 there is NO CAMRA South West London Battersea Beer Festival in 2017 at this venue. Fortunately there were no casualties however the halls at Battersea Arts Centre will not be available for the foreseeable future. The current plans envisage the new Grand Hall opening in the Autumn of 2018 - see latest news below. BAC Grand Hall during the Battersea Beer Festival on 7 February 2013 and on 14 March 2015, the day after the fire (photo: @Londonfire). As Battersea Arts Centre marks six months since the Grand Hall fire in March, plans for the future of the space are gathering momentum. Initial phases of work included specialist groundwork contractor Deconstruct installing 18.6 tonnes of steel and 40 cubic metres of concrete to bolster the gable walls in preparation for a salvage operation completed over the summer to recover materials. Next up, a gargantuan temporary roof will be erected this winter. The scaffold structure will extend beyond the external walls of the Grand Hall and stand at 24m tall. Consultations with Battersea Arts Centre stakeholders will take place over the autumn to gather feedback on potential designs for the space by RIBA Stirling Prize-winning architects Haworth Tompkins. Further ahead, a planning application is due to be submitted by the end of the year and the current aim is to break ground in autumn 2016 and open the new Grand Hall in autumn 2018.